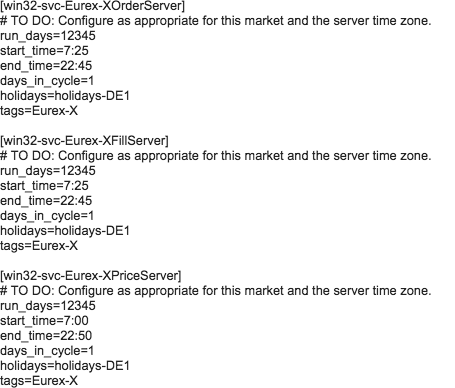 On February 27, 2017, Eurex split FX Futures products onto a separate T7 instance referred to as T7/FX. For additional details, please see Eurex Circular 004/17. Market data for these products will be moved to new multicast addressing, separate from all other Eurex products. In addition, trading for these FX Futures will be extended to 23 hours per day. Full details on the new schedule may be found in Eurex Circular 004/17. Trading hours for all other Eurex products, including FX Options, will remain unchanged, but may be extended at a later stage. Procure additional ETI sessions which will connect ONLY to the T7/FX host and will ONLY be able to trade these products. Note that after February 27, existing ETI sessions will no longer be able to trade Eurex FX Futures. Provision additional TT Eurex Gateway(s) that will be configured to connect to the separate trading host. hostinfo.cfg - New IPs and Ports will be used to connect T7/FX ETI sessions to the host. 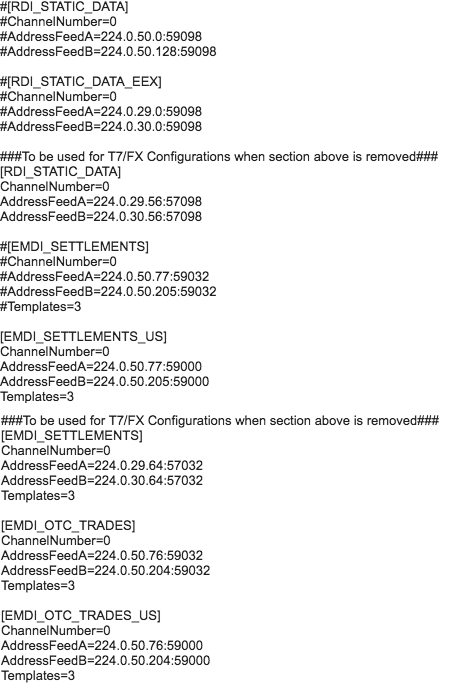 TT will provide an update in the near future which will include the specific modifications to these files that are needed to trade FX Futures. The Eurex Network Guide may be found here. 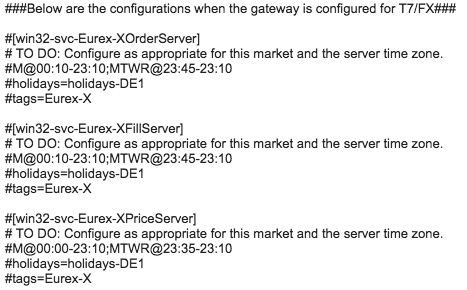 Locally hosted customers who are planning to provision a new Eurex gateway for the FX Futures products should review this guide and ensure that any needed network changes are in place prior to February 27th. Customers within the TTNET-hosted environment should contact their TAM for details regarding trading FX Futures after February 27. Open tt/Eurex/ttchron.ini_master in a text editor. Open tt/config/ttchron.ini and in a text editor. Paste the T7/FX parameters at the end of the file and uncomment the T7FX parameters. Save the changes in tthchron.ini. TT provides the MulticastGroup.cfg file required for subscribing to the T7/FX products. Before you begin, save this file on your TT Eurex Gateway in :tt/Eurex. Open MulticastGroups.cfg in a text editor. To enable T7/FX in Multicastgroup.cfg, uncomment the T7/FX channels and comment-out the corresponding Eurex channels. Save the changes in hostinfo.cfg.